Borned in 1928, the company Stella always been commited to place pleasure and sharing in the center of its preocupations. Yesterday in the bars and today for the profesionnals and particulars lovers of the inescapable Stella's style. Thanks to its very flexible workshop, Stella can imagine and produce a soccer table with your colors. Thus, the cabinet, the players, the handles or the playfield are fully customizable. Stella offers you the possibility of having a table unique that suits you and as you like. At Stella, 100% of our table soccer are handmade in our workshop in Tourcoing, France. A small team of 10 persons, passionated by their work and proud of their French know-how insure the longevity of the brand and products. Stella's table soccer are offering you a unique experience of game. Thanks to the big size players, youcan play with their heads and multiple the tricks. Plus, vous can jump the ball to make lobs. Since their creation in 1928, Stella Table Soccer distinguish themself thanks to a gamleplay unique and diversify. Did you know that the first French Table Soccer Championship have been organized on Stella's tables and that its unique characteristics have been for a while, references in competitions. To chose Stella and you can be sure to have a unique and various pleasure of playing. Stella's table soccers are equiped with taller players that allow you to play with the head thus to diverisfy the possibilities of pass and controls. Oblique side bands on the gamefield allow you to make jumping balls and then to lob your opponents to make memorable goals. Since 1928, Stella Table Soccer, it is a single ambition : offer to the Table Soccers players a shared time in family or adrenaline of a competition between friends. In the workshop in the North of France, Stella's team put all their energies to produce on demand table soccer 100% French. Thanks to the design of the table, the perfect mix between tradition and modernity they will perfeclty fit in the games rooms, bars, living room or even garden ! Imagined at Stella with passion and desire to meet around true game pleasures, its historical game, wooden and stell version of social network, seduce all the gamers...whatever the generation! It is in our workshop in Tourcoing, in the North of France, that Stella's craftsmen, carpenter cabinetmaker or peinter put all their passions to prepare Stella's Table soccer. . We attach great values to offer qualitative products. 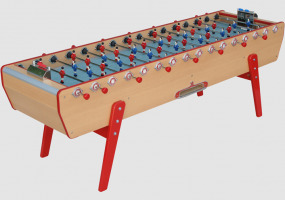 Manufacturer of table soccer since 1928, we benefit from a recognized and proven experienced. We proposed to you historical products, as the Stella Retro, indentical replica of the models created in the 50's. For the nostalgic of bars and coffees years, vous can discover the mythical product : Stella Champion Yellow and Red. We don't forget to renew our range of products by offering contemporain models as the Stella Home or Champion Millésime. To buy a Stella table soccer is to offer part of history and heritage. Thanks to our flexible workshop and our on demand production, Stella is specialist of creation customizable table. From the choice of the color to the shape of the handle or the addition of a coin box system, we can realize all our desire. Why not changing the color or the shape of the players ? The only limit is your imagination! The table soccer is an objet conveying values on conviviality and teamspirit. It is a striking and unsual support of communication. With Stella table Soccer, everything is possible without limited cost and short period.